2nd General Industrial Exhibition 2012 will be held from April 3- April 8, 2012 at Zahoor Elahi Stadium, Gujrat. This exhibition is being arranged by GTCCI (Gujrat Chamber of Commerce and Industry). The timings for the visitors of this exhibition has been set 04:00pm to 11:00pm. 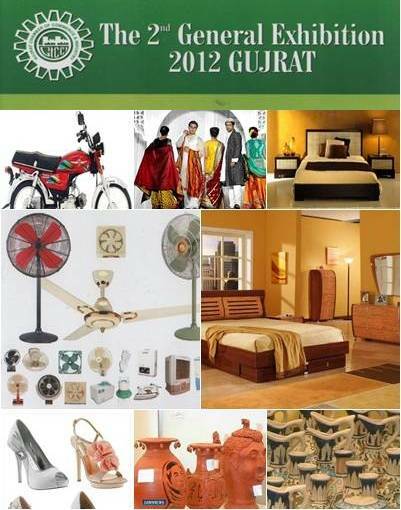 There will be more than 125 stalls by different manufacturers and producers of Gujrat in Exhibition. Manufacturers of different sectors will install their stalls in Exhibition. Some of the main sectors will be Fan, Washing Machine, Air Coolers, Furniture, Electrical, Motor Bike, Auto Parts, Shoes, Garments, PVC, Agriculture, Food, Beverages. Handicrafts of Gujrat are world famous and at this Exhibition, many stalls of handicrafts will also be built. There will also be Food Street and Joy-Land for children and teen to play games and have fun. Traffic Map and Exhibition Plan has been prepared by the management. Separate Parking facility will also be provided to visitors. There were about 110 stalls in the last years industrial exhibition, General Exhibition 2011. While more than 150 thousand people visited this 5 days exhibition which shows interest of people and industrialists in such type of exhibitions. Ministers, MNAs, MPAs, Ambassadors of different countries, Government Officials, Businessmen and Public from every field of life visited the exhibition of 2011. Such exhibitions play vital role for the development of industries and handicrafts sector of any region. These are also very important to increase exports to other countries.